The last time we lived in Tokyo, Thanksgiving was the hardest holiday for me to celebrate away from home. I worked then, didn’t have the day off, and to the rest of Japan it was just another day of the week. All I could think about was what everyone was doing at home. I pictured my family getting up early to cook and watching the parade while drinking hot chocolate. There were never any issues, everyone always got along and no one drank too much and said things no one really wanted to hear. Basically, everyone was together and happy back home in the states and my small family and I were alone and miserable. This time around, I started planning early hoping that the amount of effort put in would pay off in the end. The first people I invited were Kyoko and Michael and their daughter Kyla – friends of ours from the last time we lived here. Next on the list were Isa and Cliff, friends of my Mom and Mark (and now our friends). And then i couldn’t figure out who to invite next. So the list kind of stayed that way for at least a month. Then, while researching an article I am writing about the 60th Anniversary of the Tokyo American Club Womens’ Group, I came across an article written in the 1970’s about American families living in Tokyo, hosting US soldiers stationed at the nearby base for Thanksgiving Dinner. The light went on. I would invite soldiers. I called the President’s office at the club and inquired about the program. “Oh yes, I remember, we used to do that a long time ago. That was when there was a big USO presence in Tokyo but they really don’t exist anymore. That program hasn’t been in place for years.” Ok, a slight drawback but I was determined to find some soldiers who would enjoy my Thanksgiving Dinner. Next, I decided to send an email to the Athletic Director of Hayden’s School (The American School in Japan). Hayden had played football against 5 different bases and I thought he would have a few contacts. I received the following email response “this is very generous of you. I have copied this e-mail to two colleagues at Yokota air base and Zama army base. I hope they can get back to you with any contact person at their base.” I waited patiently but heard nothing. And then, at least three weeks after I started my search, I received a phone call from the Tokyo American Club President’s secretary. She excitedly explained that they had a call that day from a soldier from Camp Zama asking us if we still did the program where they connected American families with active duty soldiers to share Thanksgiving Dinner. And that is how I came to find Captain Mark Gross and Sergeant-Major Rick Gonzales. And as soon as they were added to the invite list, others kept coming until there were 18 of us (12 adults and 6 children). And our table was full of all our American favorite foods and we laughed and drank and got to know each other better. Hayden commented on how Captain Gross liked to take out his maps to show everyone where he was stationed and we got to hear the story about how he was wounded last year in Iraq in the neck by bullet fragments (we even got to see the scar)! Tom made a beautiful toast before we ate about how no matter how anyone at the table feels about the war in Iraq and Afghanistan, we have to support our troops who are fighting for our freedom and the freedom of others. And how even though we are far from our friends and family, they are far away and in harms way. 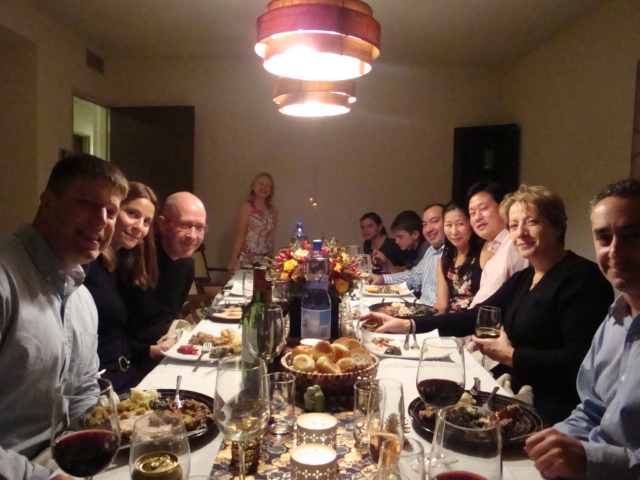 One thing I noticed at the end of the evening was how we had 18 people for dinner and there were no issues! And it wasn’t a fantasy either!!! Kidzmania is fascinating. What a wonderful way to introoduce kids to the adult world of employment. Thanksgiving dinner sounded great with friends, family, and the soldiers. Leave it to you to pull it off. Now for the questions. Where did you buy all the food to prepare for the meal? Did you have anything unusual as part of the menu? What was the hardest dish to prepare? What did everyone like the most? What was served for dessert? Also Lisa, you should be receiving “The Ultimate Rice Cooker Cookbook” by Christmas. The original book I wanted to send you was not in stock. This one has even more recipes. I need some answers, and I need them PRONTO!!!! !